Getting here is really not very complicated, and once you are in the vicinity, signposts clearly show you the way. Keep in mind that on topdays it can get quite crowded, therefore it may be wise to opt for public transport. Should you still prefer coming by car, we are glad to help you with some useful instructions hereunder. Of course, using Googlemaps makes life that much easier. Stay in good shape and take a bike! You must certainly have seen them, those remarkably coloured bikes that are to be found spread all over our capital's territory, the Villo bikes. Well now, why not choose that means of transportation to get over here; it is simple and they are nearly at every corner of the bigger boulevards and avenues of the city. And there is one right across the street when you leave the Clemenceau metrostation. It is absolutely safe and not expensive at all. How it works is explained in detail on their Villo website. Public transport still is the best way to get here, certainly the subway (metro), although at peakdays the tubes can be very crowded too. You take line 2 and leave station Clemenceau or Delacroix. Bus line 46 stop Clemenceau. In for a free tip? Get to the "gare du Midi", and from there it is only a ten minutes' walk before you get here. 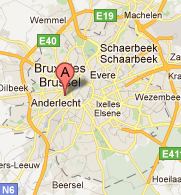 Coming from Ghent-Antwerp: turn left, chaussée de Ninove and drive to the 9th traffic light. 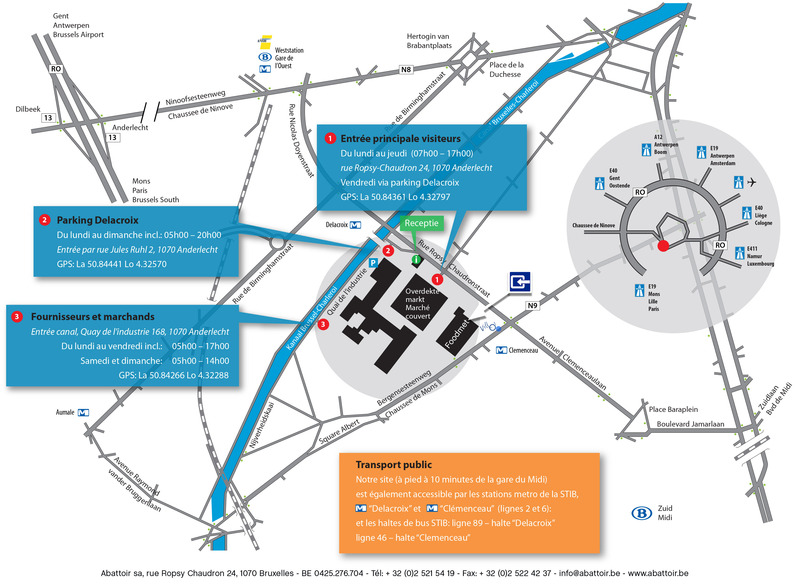 Coming from Mons-Paris: turn right, chaussée de Ninove and drive to the 8th traffic light. At the traffic light turn right and follow the rails of the tram, cross the Charleroi canal bridge. The rue Jules Ruhl is at your right hand side, a bit further down the canal. The Delacroix car-park is about halfway this street. At the gare du Midi take the direction of "place Bara" and continue along the avenue Clémenceau. At the crossroads with the chaussée de Mons you carry straight on and follow the rue Ropsy Chaudron. On your left you will see our entrance marked by two huge bronze bulls' statues. The rue Jules Ruhl is 50m further down. The Delacroix carpark is about halfway this street.